I read your story HERE and realized maybe you don't understand how trailers work. The first trailer was release in January 2016. This is the one you saw and and made the decision to drive so far to see the movie. Did you know Studios hire a third party company to produce the trailers? The Studio does not create the trailer; a separate company not attached to the studio does. The Studio gathers the finished footage they have (not the whole movie only the footage they've finished filming) and gave it, with a summary of the movie, and a list of songs they have the rights to use to this Third party company. The Trailer Making Company then goes through all the footage, finds the best parts, add their effects to it, and puts it all together in a package trailer. Many times things from the trailer that was release months before the movie came out will be missing scenes and we can only hope they're on the DVD's deleted scenes. Why does this happen? Because we simply can not have 5 hour movies! Scenes that might have been great, might have had a great flaw that wasn't seen by our eyes in the 2 seconds they showed in the trailer, but could have ruined the scene in a clip that would last a minute. The 2 second clip you wanted to see may not have contributed to the actual storyline, since you complained mainly about the lack of Joker scenes, this might be the case. 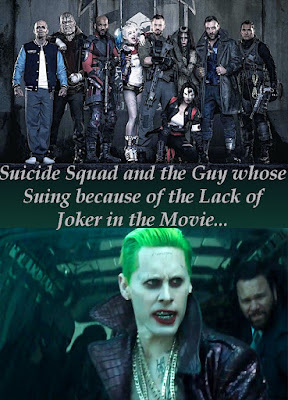 This was not a movie about the Joker and his adventures! This movie is called Suicide Squad based on the comic series and while Joker may show up from time to time He Is NOT A Main Character! As for Katana, I'm trying think when the best time would have been to add in the eyes turning black scene? How much extra time would have been needed make that short scene make sense? Did they need to do a eyes close up on everyone, so they one that looked cool worked in the moment? That would take too long. The movies is already 2hrs and 3mins, you wanna make it 2hrs and 4mins now? You wanna add in a Joker fight scene for another 4 minutes? So now it's 2hrs and 8mins, but we need a connecting scene for the current story to the Joker Fight scene, that's another 2mins, but we have another great scen... They have to cut it somewhere and stop making changes because it's never be finished otherwise. Film is funny that way, any kind of art is. It's never ending, but we must stop at some point if we want anyone to eventually see it. A trailer is only a preview of what the general movie is about and the Trailer you saw (posted above) did that. It was only a preview of what the finished product would generally look like. Suicide Squad did that! Always keep in mind, most films are still being edited, adding special effects, and reaching their final cuts as early as less than a month before the final release dates. The first trailer was created 8 months before the final cut was finished. Those creating the trailer for this film could not see into the future to know they would not use certain clips. Art is a fickle thing, if you don't like it, get over it and find something else. Are you gonna sue Pablo Picasso because you disliked his work on Les Demoiselles D'Avignon? There is only one movie I can remember, that I would have been willing to raise a stink about... Check out this trailer! My family and I nearly spent $50 a ticket to see this movie at a theater that served prime rib and wine. Luckily a couple in front of us took the last two seats together (my brother was fine to sit further away, but my mom and I wanted to sit together). So we left and only paid $8.50 a ticket and bought some popcorn and soda at a different theater. I also lost a chance at becoming a regular employee at my job (I was seasonal at the time) because of this movie. So why was this movie the only one I would have sued over? Because I went to see a Military movie and instead got a boxing movie. I'm not a fan of Boxing. In the trailer there was one, just ONE, one second clip of a boxing match! The trailer was COMPLETELY misleading! The trailer did NOT give a general feel for the movie. It was 90% Boxing and 10% Military, where as the Trailer told you 90% Military and 10% Bars, boxing, and other stuff. The real question is Did I Sue? I mean, come on! I kinda lost my job because of it! But, No... No I did not Sue! Although, in this case, I could've won! Ok, I'm done with my rant, I'm over it! Life goes on! We all make mistakes in life and we need to learn from them rather than blame someone else for them. Think about the journey and laugh about it; otherwise you'll be a very unhappy person.